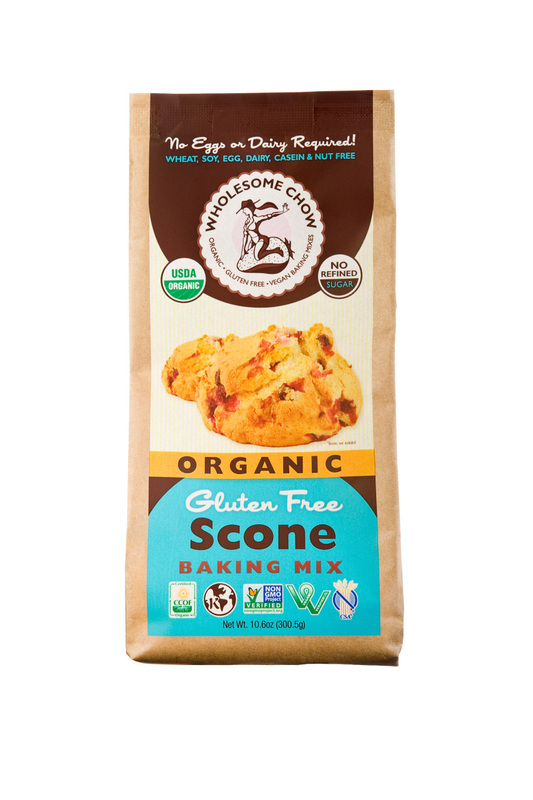 A few weeks back, my sister shared on Instagram that she was having a bacon scone, and it’s times like those when I start to really hate having a gluten sensitivity. Then that feeling is immediately followed by the determination to make my own gluten-free variation of that tasty treat. 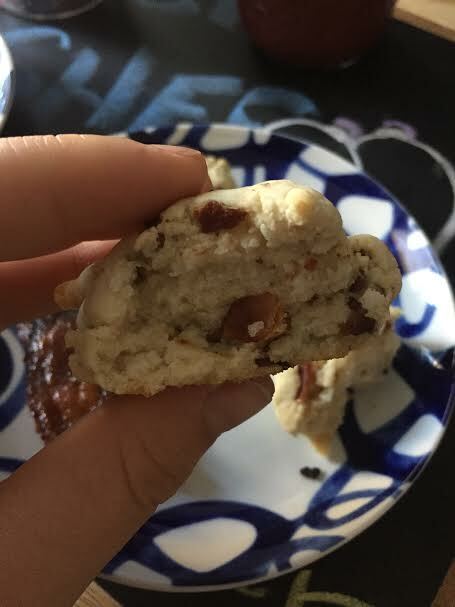 I happened to walk into a store the next day (literally one day after my sister shared the post) and found Wholesome Chow‘s gluten-free vegan (if you don’t add bacon) scone mix, and I scooped it up! These were the easiest things to make too. I put some bacon in the oven while I was getting the ingredients together. I followed the instructions on the packaging, swapping out the oil for bacon grease (again, droooool…), and then I took some of the crispy slices of bacon out of the oven (I used four slices of bacon for eight scones) and used kitchen scissors to snip them into little bits, mixed them into the dough and then scooped them onto the baking sheet (which I also greased with the excess bacon grease. (I might have gotten a bit excited about the whole bacon experience. I baked as recommended on the packaging and then plated them with, yep you guessed it, more bacon! While I cooked, P made us espresso, and then we settled in with our delectable breakfast. 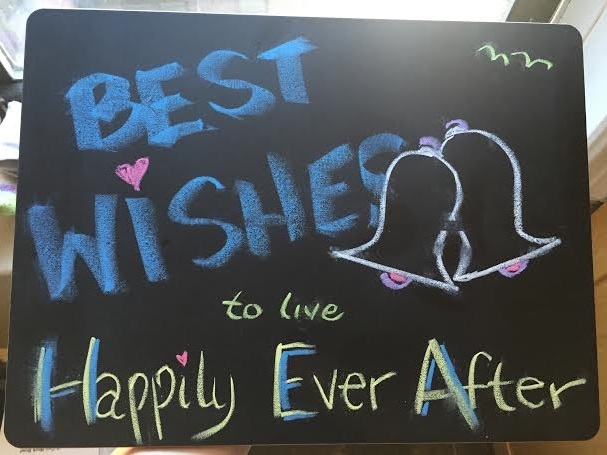 I plated them on our Crate & Barrel plates that were a wedding gift and served them on a Chalk Lots chalkboard place mat, which I won a few weeks back and when I received them in the mail this sweet message was on the top place mat. 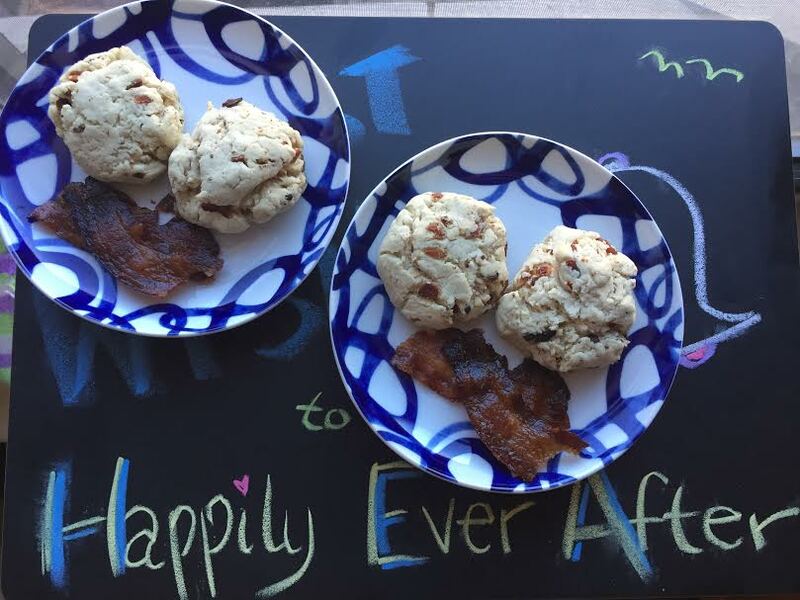 I don’t even know how Leslie knew that we were newlyweds, but she did her research and somehow sent us this sweet note that really made my day and made serving this breakfast on our anniversary weekend extra special! What recipes have you been drooling over lately? Do you ever have to try and reinvent recipes to accommodate your dietary restrictions? I’m getting pretty good with swapping out ingredients and making things gluten free! Oh, scones. I love them! I will need to try these. Of all the scones I have ever had though, I still love the Puyallup Fair ones the best. Standing in line at the end of the night, and buying a full bag of them so you have enough for days! Every so often my Mom will mail me a couple of packages Fisher Fair Scone mix. Thanks Ashley! They were seriously so good and so easy! OMG they were so good! !